Manchester United?s performance on Wednesday night against Juventus was interesting. While it wasn?t the great counter-attacking football of old, there was a new positivity to José Mourinho?s approach, which went down very well with the Old Trafford faithful after so many months of life-sucking displays. Eventually leaving the stadium with all three points thanks to a last minute own goal from an Ashley Young free-kick, Manchester United put in a shift, and it didn?t go unnoticed by the Italian media. 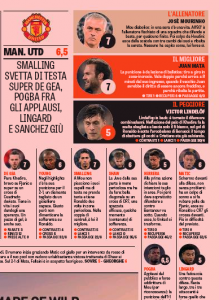 Gazzetta dello Sport felt the best player on the pitch was Cristiano Ronaldo, giving him an 8/10, and few will argue with that, as his goal was one to remember, but what follows are three 7s, handed out to David De Gea, Chris Smalling and Juan Mata. Despite claiming the Spanish goalkeeper ?keeps his team alive by giving them hope?, the Italian paper gave their ?The Best? award to the diminutive forward, giving him double points because ?old Juan should have still been cold, and he?s the one who turned the game around?. As for their ?The Worst?" On Manchester United?s side, that went to Victor Lindelöf, whom they very cleverly (sarcasm) dub ?Lindeflop?, feeling he was out of position a lot, and was at fault for ending up under Bonucci?s lofted through ball to Cristiano Ronaldo for the goal.